Bony, do you see this? Your disc is extruded like this. 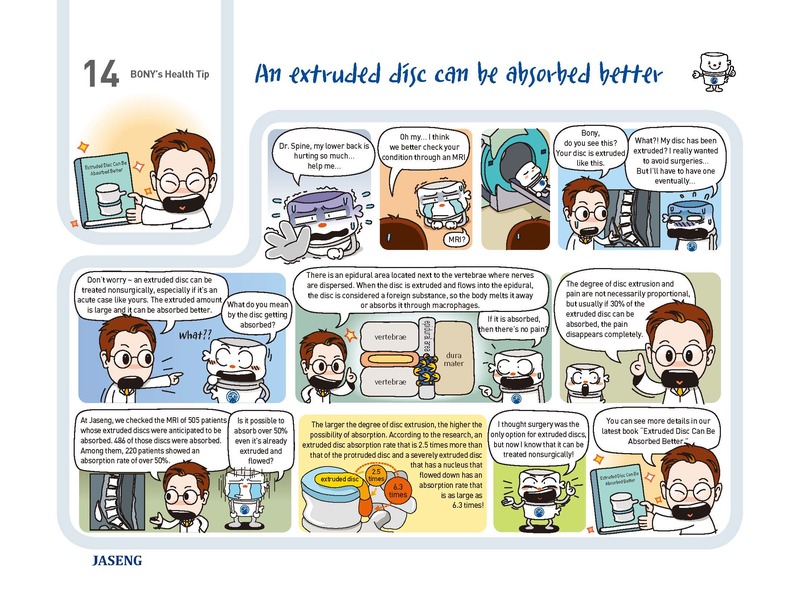 Don’t worry ~ an extruded disc can be treated nonsurgically, especially if it’s an acute case like yours. The extruded amount is large and it can be absorbed better. What do you mean by the disc getting absorbed? There is an epidural area located next to the vertebrae where nerves are dispersed. When the disc is extruded and flows into the epidural, the disc is considered a foreign substance, so the body melts it away or absorbs it through macrophages. If it is absorbed, then there’s no pain? The degree of disc extrusion and pain are not necessarily proportional, but usually if 30% of the extruded disc can be absorbed, the pain disappears completely. At Jaseng, we checked the MRI of 505 patients whose extruded discs were anticipated to be absorbed. 486 of those discs were absorbed. Among them, 220 patients showed an absorption rate of over 50%. s it possible to absorb over 50% even it’s already extruded and flowed? The larger the degree of disc extrusion, the higher the possibility of absorption. According to the research, an extruded disc absorption rate that is 2.5 times more than that of the protruded disc and a severely extruded disc that has a nucleus that flowed down has an absorption rate that is as large as 6.3 times! I thought surgery was the only option for extruded discs, but now I know that it can be treated nonsurgically!